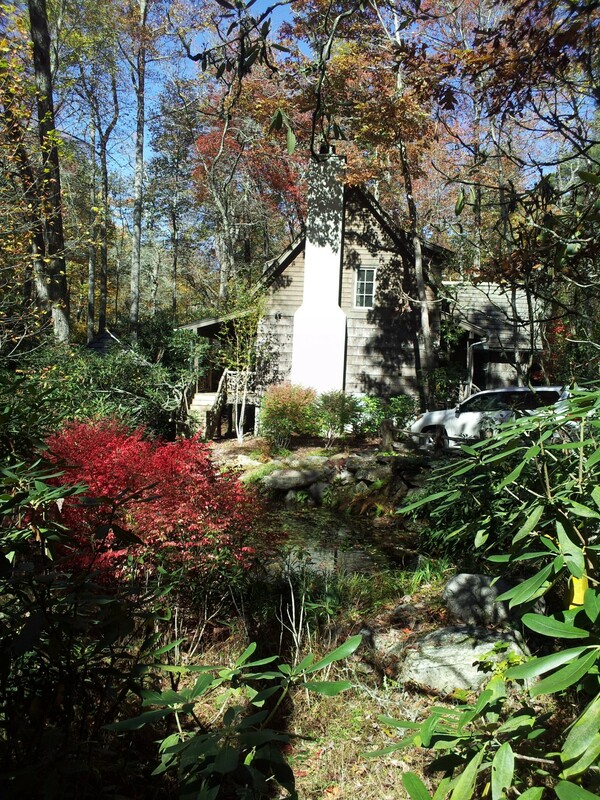 Nestled in wooded acreage among holly, pine, hemlock, rhododendron and mountain laurel, Lee's Camp provides a comfortable base to explore the many adventures available in the mountains of Western North Carolina. This upscale, private, in-town cabin on 1 full acre of land is tucked away in the middle of the forest down a quiet gravel road, yet is located less than 1/2 a mile from the crossroads of Highways 107 and 64; only 15 minutes from Highlands, 5 from Sapphire, and 10 from Lake Glenville. It is truly the best of all worlds when you're in the mountains! Lee's Camp was recently built and furnished to a high standard to provide our guests the utmost comfort and convenience. Enjoy central AC and high-efficiency heat as well as a wood-burning fireplace. The kitchen is fully equipped when you want to cook in rather than enjoying one of the many restaurants located nearby (major grocery is 3 minutes away). To make you feel at home, our cabin features pillow top mattresses, all cotton bedding including 300 count sheets, and down comforters with duvets and down blankets or cotton quilts. The design touches throughout the cabin are numerous and are sure to please you throughout your stay. The downstairs master bedroom offers a queen-sized bed and a full bathroom with an oversized jacuzzi tub and a rain shower - perfect for relaxing after a great day in the mountains. The upstairs bedroom offers a king-sized bed and a full bathroom as well. And the upstairs loft area offers two twin-sized beds that can share access to the upstairs bathroom. The living room has a wood-burning fireplace, a large flat-screen HD TV, and an iPod docking station; and the cabin comes with free WiFi Internet access, a Skype phone for free incoming and outgoing calls, DVD player, and Netflix service for watching movies and TV shows. The back porch is a great area to sit and relax. It's outfitted with a covered grill for outdoor cooking, rocking chairs, and dining area. And there is a small pond close by with a waterfall to enjoy the gurgling sound of running water. We look forward to welcoming you to our special mountain retreat!